This impressive vehicle makes a brilliant family car because it's roomy, comfortable, refined, and affordable to drive. The Nissan Qashqai features automatic transmission, advanced safety features, high mile fuel efficiency, great cargo capacity, comfortable interior, and sleek overall design people love. The vehicle is made to handle well in any weather conditions and is a great way to get to whatever is on your to-do list and to do with wit total control and plenty of style. Wherever you are going and whoever you are taking with you, the way to go in comfort and style is in the newest vehicle from Nissan. 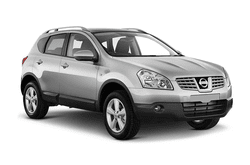 Check out the Nissan Qashqai Auto today and see the difference for yourself!